TSR manufactures and supplies a wide range of slew bearings, covering a full spectra of design and application. We provide a solution from our standard range of slew bearing design, of which some are available ex-stock. Slew bearings are manufactured to concurrently handle axial, radial and over-turning moment loads. 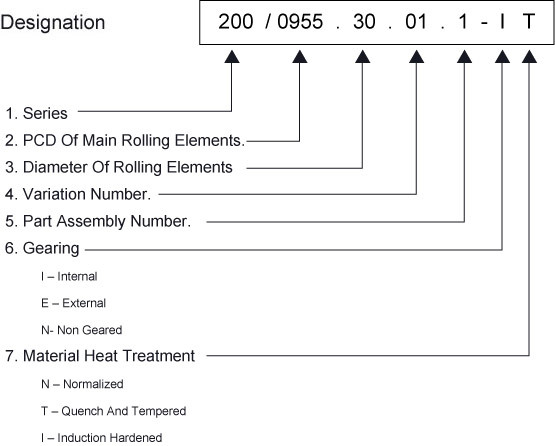 Static load and dynamic lifecycle calculations can be provided to confirm slew bearing suitability. Our slew bearings are manufactured to reliably function in all operating environments, including high temperature exposure and / or arduos environmental conditions. Our slew bearings are fully interchangeable with existing slew bearings, and provided we receive a slew bearing part number and / or drawing, we can manufacture equivalent slew bearings. Our versatility and flexibility ensures that we efficiently and cost effectively manufacture quantities as low as one unit. 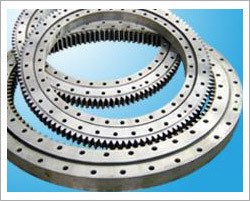 We therefore welcome inquiries for all slew bearing types & quantities. Our well coordinated and integrated supply chain & manufacturing capacity, ensures that we offer high quality product at reduced lead times, further assisting customers in winning tenders and potential orders. We are also able to manufacture matching drive pinions, to achieve input and output torque requirements. We offer our standard 12 month warranty against faulty workmanship, on all new manufactured slew bearings. Below you will find our standard slew bearing design types that we manufacture. Should you have special requirement, these design can be reviewed. We are also experienced in the design and manufacture of split slew bearings. These are generally used where it is impractical to disassemble entire machinery, for slew bearing replacement. This achieves greatly reduce down-time, representing significant costs savings to the client.